Note: the title is not actually a random collection of words. What's going on here? Quite a lot, as it turns out. 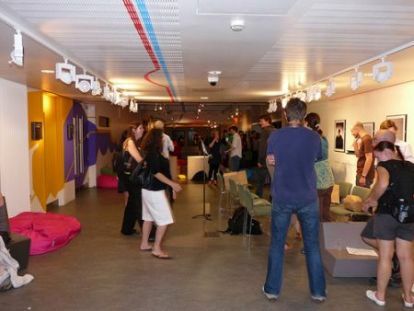 On Wednesday 24th June 2009 I attended Sandpit 13, one of the many events organised by Hide & Seek. It was incredibly varied, persistently fascinating, and a bunch of fun. The Sandpit is a monthly ‘pervasive gaming’ night in London. To use Hide & Seek’s own words, “Pervasive games transform the city into a playground, make your heart race, change the way you see the world, [and] get you playing nicely with others”. I think these types of games are a product of recent technological advances in two senses. In the most direct sense, they frequently assume that mobile phones and digital cameras are sufficiently ubiquitous that almost everyone will have one, and they also make full use of the latest tools and services (from GPS aware mobiles to feedback via Twitter hashtags). In the less direct sense, the games are very often being developed following the ‘Release Early, Release Often‘ philosophy, with the players providing feedback or becoming full collaborators in future refinements of the game. I got to experience three very different games at Sandpit 13: ‘The Following’, ‘The Postman’, and ‘Free London’s Monsters!‘. In the next few posts I’m going to try to convey my experience of these games, and in the spirit of collaboration offer my own conclusions about their gameplay. (A chalkboard at the event invited feedback to be submitted using the Twitter hashtag #sandpit – my currently directionless Twitter account can be found @metatim, and that shall serve as a synapse between this post and the requested hashtag). It all began at the Spirit Level, a somewhat hidden part of the Royal Festival Hall. We arrived 20 minutes after the start time and were immediately confronted by a fascinating kind of chaos – over a hundred people, interacting in strange ways with unusual items, surrounded by foam furniture, instructions of all kinds taped to the walls or the floor, or on blackboards or whiteboards, several games evidently in progress, and many more evidently forthcoming. Random pieces of card throughout the room advised anyone that cared to read them to “watch out for the whistling postman”. More on that later. Thanks to an unusually high density of whiteboards, signs, leaflets, and people that looked as if they knew what was going on, we identified and approached the registration desk. Moments later we were drawn into our first game of the evening. This entry was posted in participant and tagged games, hide and seek, participation, pervasive, sandpit, sandpit13, test. Bookmark the permalink.